It’s that time in our timeline of existence for you, dearest readers, to unite with us in the effort to spread Confidential joy! We have launched a drive to raise half our printing costs for C-U Confidential issue 10 using GoFundMe. 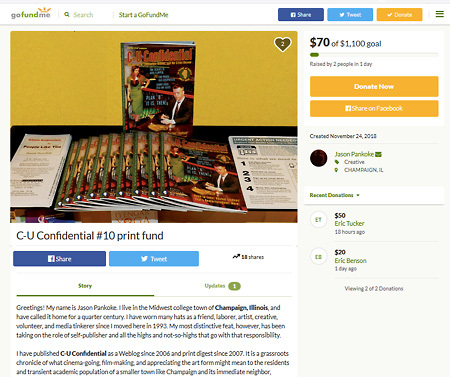 Your humble editor decided to go this route because he believes that GoFundMe is the commonly-used platform that is best designed to stress the human aspect of what can be accomplished with a campaign and, trust us, he’s making this one personal. We’ve already explained our plans here and rationalized our need to put ink to paper here, but you should definitely visit our GoFundMe page to take in our modest proposal all told and decide if it is worth your while to participate. We will park this reminder at the head of C-U Blogfidential until we pass our self-imposed deadline of Sunday, December 30, or exceed our $1,100 fundraising goal, whichever transpires first. If all goes well, we hope to see you on the flip side of the New Year with a freshly-minted lot of CUZine in hand just for you! Cheers! This entry was posted on Monday, November 26th, 2018 at 12:45 pm	and is filed under C-U Confidential, Crowdsourcing du C-U, Print Matter du C-U. You can follow any responses to this entry through the RSS 2.0 feed. Both comments and pings are currently closed.